The creation of F.T.L. has a rags to riches back story - being Crowd-funded via Kickstarter. The developer Subset, a two man team, requested $10,000 and got pledges of $200k. This would of course be a waste of cash if F.T.L. was a terrible game – but thankfully this is not the case, and the setting – "keep moving through the galaxy" - is easy to map to many favourite Sci-Fi TV programmes without too much trouble (Firefly: Just keep flying. Star Trek: Boldly Go..., Battlestar Galactica: Flee the pursuing Cylons). If you are so inclined you can even rename your crew and ship appropriately at the start – so step forward Evans, Kirk and Adama on board the starship 'Awesome'. F.T.L. carries with it the aesthetic of a 90's strategy game – with clean visuals akin to an Amiga, or early DOS game, and the not-quite-turn-based, not-quite-real-time play feels like a modern descendent of Laser Squad, had Julian Gollop never taken the X-Com series into Isometric 3D. Playing (but not winning) F.T.L. is very easy – simple left click/right click mechanics allow micro-management of your spaceship, its systems and crew. 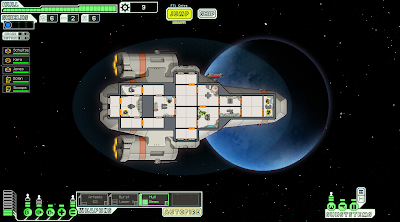 The available power systems can be distributed to different on-board services (weapons, shields, jump-drive, oxygen, medical-bay) – and changing these must always be accompanied by the player shouting "Scotty, re-route all auxiliary power to the primary shields... Aye-aye captain." or similar.) Along side the ship's power management, Crew need to be directed on board – manning different systems increases their efficiency (For example, increasing the chance of being able to dodge if being attacked), and once engaged in a battle the crew may have to be sent to repair ship systems, fight fires, and tackle any enemies that have boarded the ship. Being able to pause the game at these points to plan what you're doing next becomes vital. Space battles can become a tense juggling of damage limitation, whilst awaiting the F.T.L. 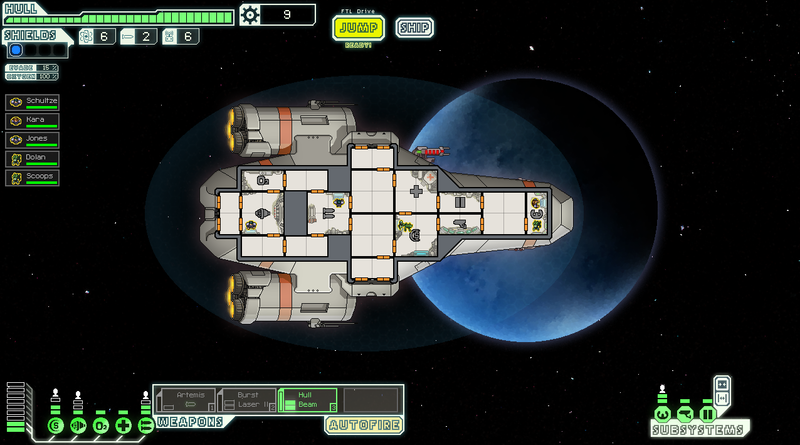 drive to prime, or a tactical volley of missiles and lasers – targeting one another's shields, weapons, or oxygen supplies – and strategies such as using your computer systems to open internal doors to vent oxygen into space, thus fighting fires or injuring boarders can be useful – but this runs the risk of suffocating your crew later. 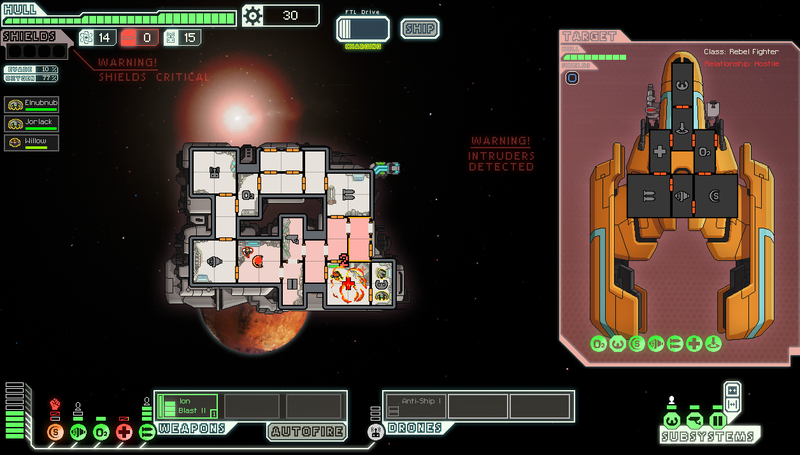 Defeating an enemy vessel leaves scrap that can be used to upgrade the ship, or sell at the occasional trading outpost. 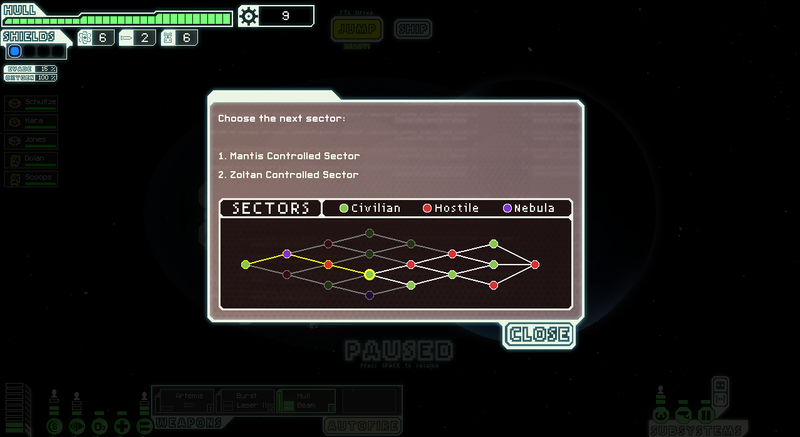 When not engaged in battles the game is about choosing your route from sector to sector through space. Each game offers a different randomized set of locations, with potentials encounters at each – from hostile enemies, to fellow crews to assist. 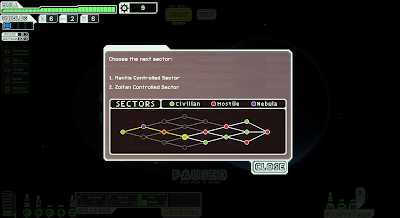 Via these encounters extra crew may be hired, or special upgrades to your ship found. The random nature of this means that some games will throw the player something useful early on, and other games will seem to plunge the player into a no-win Kobayashi Maru. Death is inevitable, and F.T.L. is not shy in dishing it out. 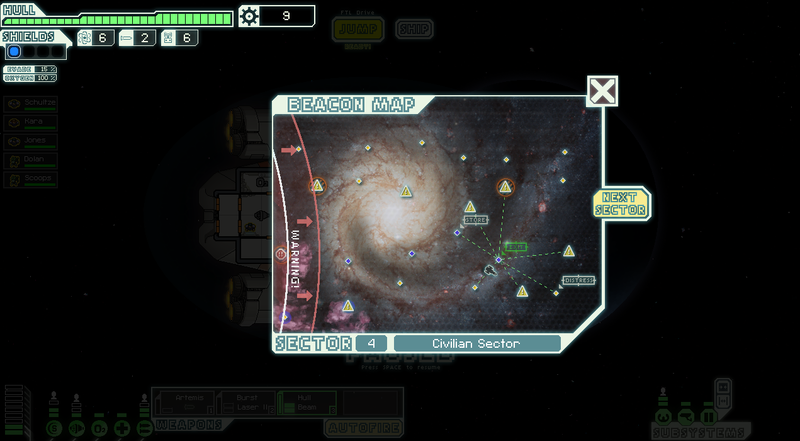 Crew will die, ships will be lost, and you'll be back at square one to start out again into the blackness of space. Continued play will unlock different space ships, and achievements which can alter your approach – thus the longevity of the game is increased dramatically. The whole feel of the game is one that exudes care – the basic system is not overly stretched – but there seems to have been an awful lot of effort put into making a variety of encounters. Repetitions are inevitable, but crucially these are not to the point of distraction or boredom. The rogue-like nature (random encounters and maps, permanent death, quick games – a few minutes if it goes badly, an hour if you do really well) works excellently in this space-opera setting – with each game feeling like it had a narrative in the player's mind. The slightly punishing difficulty harks back to days of old rather than just feeling arbitrarily harsh. Overall, F.T.L. 's only flies in the ointment are the that it can be unfair on the player through unfortunate randomization (a fault that can nearly always be levelled at titles with randomly generated game-maps/encounters), and the fact that after some time playing the game you will start to feel you've seen the bulk of the encounters available to you. There doesn't seem to be anything revolutionary in F.T.L. – indeed it feels like a game that could have been made years ago – but rarely has it been done so appealingly. Very highly recommended for a healthy dose of spare-time sapping sci-fi-strategy-simulation. Buy the game here (from the Subset website). 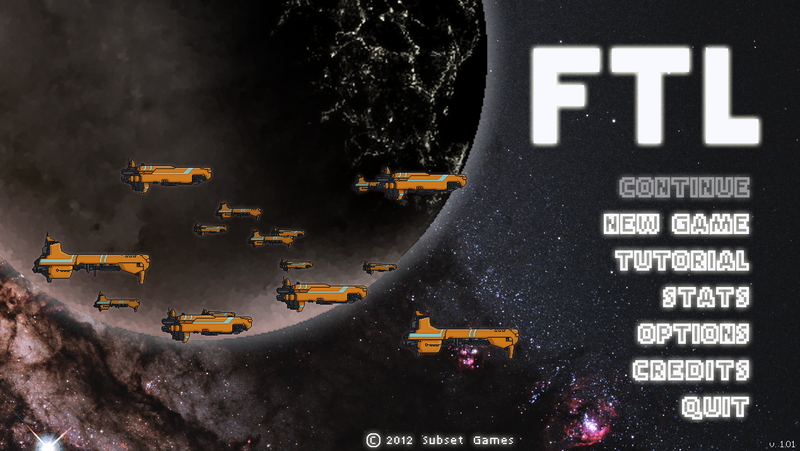 FTL is a near clone of 1980s Star Trek grid based games that I remember playing on the c64. I have played it quite a few times, addicting game!